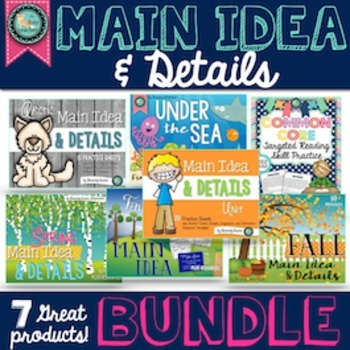 Main Idea and Details Bundle! Save $$$! Teach, practice, and reinforce this Common Core reading skill. Eight main idea packets with a variety of themed and seasonal passages give you plenty of resources for practice finding the main idea and key details of a passage. Check out the Main Idea and Details Category of my store to see the individual packets that are included! That's currently over 80 unique passages plus many graphic organizers, anchor charts, and interactive notebook templates to use for main idea throughout the year. All packets support Common Core reading standards RI.1.2, RI.2.2 and RI.3.2. The passages are ideal for second graders but could be used as extra practice or intervention with third graders. The passages may be too difficult for first graders to read independently but you could always read the passage aloud and still give students scaffolded oral practice with this important skill! Display the passage on your interactive whiteboard and work with younger or struggling readers this way!